CALAIS, France — The migrant camp in northern France known colloquially as “the Jungle” does a roaring trade in energy drinks. Row upon row of Red Bull and Monster Regular cans line the wooden shelves of a makeshift convenience store serving the camp’s mostly male inhabitants. The caffeine-heavy drinks sell in droves for €1 ($1.12) each and it is little wonder. The dozens of migrants who each night use the cover of darkness to try and hitch a ride on a heavy goods truck need all the energy they can get. Their coveted destination is Britain, but the British government is funding a new 4-metre-high barrier close to the northern town of Calais that it hopes will stop them trying. LONDON — Scenes showing the Turkish flag, Istanbul’s Grand Bazaar and boats buzzing across the Bosporus were transmitted to millions of British television viewers on Wednesday night. But it was not the latest advertising spot by Turkey’s tourist board. It was a warning against Turkish membership of the European Union – coming in the form of a propaganda broadcast by the U.K. Independence Party (UKIP), a right-wing group that took nearly four million votes in last year’s parliamentary election. The broadcast contained extensive footage of mosques and women wearing headscarves before urging viewers to vote against Britain’s continued membership of the E.U. in the country’s forthcoming referendum. The bird squirmed, unable to escape his grasp. It was weeks away from being thrown into the arena as gambling fodder in a cockfight. While the farmer returned it to its small cage, his sleeve pulled back to reveal a nasty gash on his arm. Was that the work of one of his angry birds? 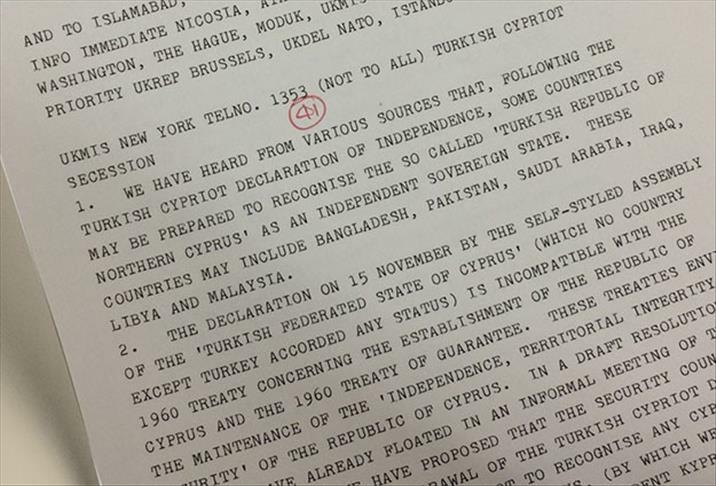 LONDON — An armed confrontation between Greek and Turkish soldiers on the island of Cyprus was a real possibility as recently as 1983, declassified documents have revealed. Papers released in London show that Greece’s then Prime Minister Andreas Papandreou was prepared to send troops to divided Eastern Mediterranean island after the Turkish community unexpectedly declared an independent state in the north. He made the offer of military support to Spyros Kyprianou, the then leader of the Greek-Cypriot administration, at an emergency meeting in Athens just hours after the Turkish Republic of Northern Cyprus (TRNC) was proclaimed on Nov. 15, 1983. British Prime Minister David Cameron must rue the day in 2006 when, as the newish leader of his Conservative Party, he described members of the U.K. Independence Party as “fruitcakes, loonies and closet racists, mostly”. That same party, commonly referred to as Ukip, comfortably defeated the Conservatives on Thursday to win a parliamentary seat in a special election in Rochester and Strood, a suburban district around 60 kilometers (38 miles) southeast of London. The right-wing party favors Britain’s immediate withdrawal from the European Union and placing much stricter curbs on migration to the country. What makes the defeat embarrassing for the British premier is that the winning candidate, Mark Reckless, was the second person in as many months to defect from Cameron’s party and successfully defend the seat for Ukip.